I stumbled across this charming book of paintings and poetry by Douglas Florian this week. Have you read it? like fallicopters to the ground. Simple poetry with darling illustrations, and lines that visually trip down the page. And that word? Autumnblings. So clever. It describes too well the rolling, jumbled pace of recent weeks. Beautiful Autumn is tumbling by. I have a dozen posts spinning in my head. Posts I may never write. Posts about twin comparison, twins in school, twin mentality. Posts about wealth. God’s abundance and ours. What we do with it. What we tend to hold back. A post about anger and how to get the mad out. A post about loss and living and a wooden box I had made for a friend. A post about my Mom. So much to say. And never enough hours. Last night was our book signing at The King’s English book shop. It was a nice evening. Intimate and sweet. I looked out at all the faces I knew and felt so grateful for good neighbors, good friends, and a good family. Thank you to those of you who came, who called, or texted. Your words of support meant just as much to me as if you were sitting in one of those chairs. workers in and out of the house trying to repair damage from a broken drain-pipe. I can’t even aspire to that. I’m just trying not to BE the storm.”And I thought, now that’s the kind of bar I should set. Just don’t BE the storm. Isn’t honesty refreshing? tends to fuel anger? It sparks. It gives our children permission to ignite, and soon it spirals upward into a full-on eruption? up against the patience challenge every day. like grace, a fresh morning, and forgiving children. Autumnblings. I’m kind of in love with that word. As I bumble along, day in day out, cleaning up messes. My own. And theirs. Autumn break for us was slow and simple. Simple joy. Like building with cardboard boxes for an afternoon. It was quite the construction site. All they needed were a few butter knives (can you hear the sawing of cardboard?) and a roll of duct tape. Or old-school. Look at that smile on David’s face as Sami gives him a shove. The last day of Autumn break, we went to Cornbelly’s with the Lehnardt and Linkous families. Hans and Xander were good sports to pal around with Spence and Gordy. My boys think these two are the real deal when it comes to super heros. And I can’t disagree. They’re pretty much Awesome. We rode the cow train. Cute Gabe. I will mourn the day he combs his hair. 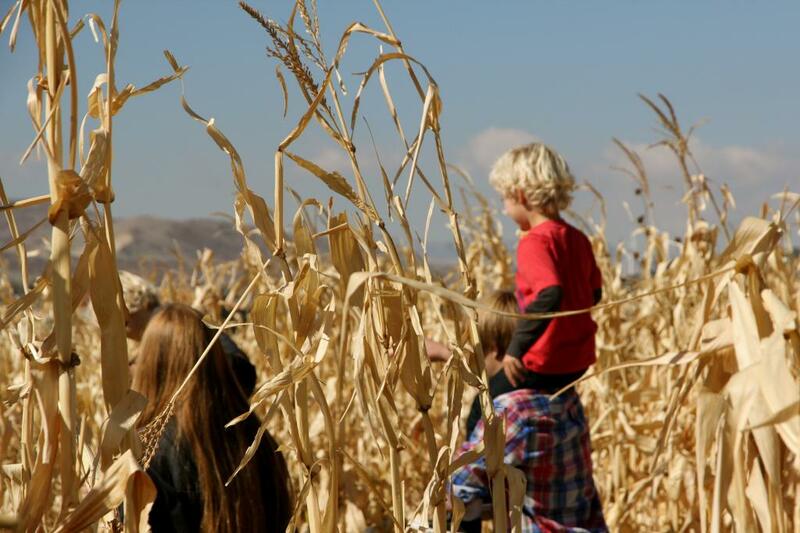 Traipsed through the corn maze. And the boys grew corn tassel mustaches. This one looks surprisingly real on you, Xander. Yee-Haw! It was so nice to be with Michelle. We haven’t been able to run together lately and time to talk always feels too short. Looking out at all that corn. After the maze, we raced rubber duckies, slid down the slides, bounced in all the bouncy houses, and shared pumpkin donuts. It was a warm and happy day. I love this life. Bursting, busy, full. And imperfect. That night I was the storm? That night I couldn’t hold it together? It was rough. Things still didn’t feel right after I had tucked everyone into bed. Then I remembered: When I am most frustrated by a child’s behavior, that’s my signal I need to draw closer to that child. Even if only for a few minutes. No matter what happens during the day, we can make it right. We can end it with love. oh Cath, I have so been there. I feel like I'm never the eye of the storm, almost always the storm, or at least the beginning of the storm. I love how you've put it here. I especially love "When I am most frustrated by a child's behavior, that's my signal I need to draw closer to that child." I need to remember that after my stormy days. Love you and your deep good soul. Beautiful Cath, just like you. I enjoyed a few hours with your boys today. They are darling. You are raising awesome kids. Enjoy your break. Thank you for your honesty about trying not to be the storm, going to our children when we've had bad days with them, and ending in love. So important!! I think you're going to persuade me to start reading blogs again! I've been almost completely out for about two years or so, but I may just have to jump back in. Thanks for writing so beautifully from the heart. Can't wait for the NZ posts! Few women can be so real and so wonderful and inspire so much. You are the salt of the earth. Why am I bawling over this post? Hits so close to home I guess. I hope to be as wise and loving as you were, the next time I become the storm. Thank you for writing what you do, it makes such a huge impact. You help me be better.